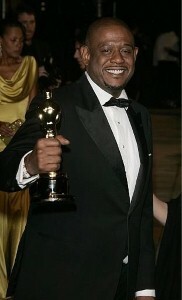 Academy Award-winning actor Forest Whitaker admits he got a lot of practice for his newest role at home. Whitaker is currently playing Ira in the film adaptation of the children’s book Where The Wild Things Are. He tells Parade that he grew up reading the book and that he’s been reading it to his kids for years as well. He says his children have always liked when he grunted and groaned like one of the Wild Things while reading to them. "When they were younger, I’d do it a lot when I’d read them the book. They loved the scary parts," Whitaker said. Although he’s a master of acting the part on screen, he says that he’s just not a "tough love" type of father. "They come to me when they’re trying to slip something by. I have to always take a pause when they come and say, ‘Hey Dad, is it okay if we do this?’ So I just look at them like, ‘Have you talked to your mom about that?’ They know Im the easy one," he tells Parade. Whitaker has been married to wife Keisha since 1996. Together they have daughters Sonnet, 13, and True, 11. His son, Ocean, 19, and Keisha’s daughter, Autumn, 18, are from previous relationships. In addition to winning an Academy Award for Best Actor in 2006 for his role in The Last King of Scotland, Whitaker has also won a Golden Globe and a BAFTA. He’s a producer and director as well as an actor.